A steakhouse, or chop house, conjures up visions of thick, juicy cuts of beef grilled to just the right fork tenderness. Excellent restaurants across New Mexico are serving up everything from top-notch dry-aged steaks to the classic sirloin served with a side of tra-ditional green chile. Here are 10 that capture the essence of the early 19th century begin-nings of this grilled, pan-fried or broiled meal. This restaurant was popular during the heyday of cross-country travel on Route 66 and that hasn’t changed in the 40-plus years it’s been serving customers. The rustic decor, accented by white tablecloths and cozy booths, is part of the historic charm. Diners will enjoy an inviting upscale style supper club that serves first-rate dry-aged steaks. From the black angus T-bone to the filet mignon to the New York strip smothered in roasted green chili, mozzarella and cheddar cheese, the steaks are tender and succulent. A good old-fashioned steak house that knows how to cook a cut of beef. A renovated adobe with a welcoming courtyard just off Taos Plaza in the heart of the City provides a 1920s-inspired comfortable, yet elegant dining experience with great steaks as its modus operandi. Begin with the steak tartare with cilantro aioli appetizer and move right on to a filet, ribeye, New York strip or grilled filet medallions. All the steaks are from free-range, hormone and antibiotic-free beef cows. 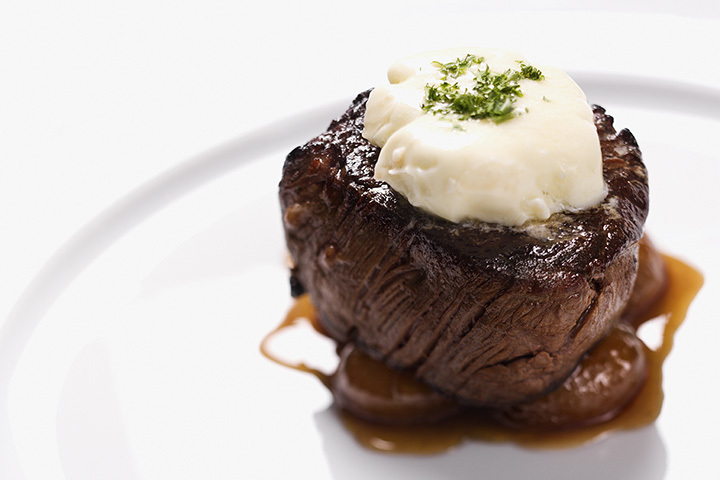 The steaks are thick and juicy and paired with the garlic mashed potatoes, a memorable experience. Since 1976, this restaurant claims they’ve been serving the “best steak, salad and seafood on both sides of the Pecos.” By all accounts, the claim is true. The Old West theme captures the era that made cattle barons king and the steaks are just as noble. Whether you try the filet mignon wrapped with bacon, the sirloin beef kabob or the New York topped with green chile and melted jack cheese, you will feel and be treated like royalty. There’s an extensive salad bar, so you can turn any steak meal into a delicious steak salad. A USDA prime, T-bone cut steak from a corn-fed cow served in sizzling butter—what could be better? Maybe the El Matador, a charred sirloin strip, served with green chile, sautéed mushrooms and onions straws. Or perhaps the classic cowboy cut bone-in ribeye. There are seven other hand-cut steak options to choose from on the dinner menu here, so you really can’t make a bad choice. A great place for lunch—or even better a romantic dinner for two in its cozy atmosphere. Since the 1970s, adventurous diners traveling the Rio Grande corridor have been enjoying dinner by candlelight here—and some darn good steaks and fork-tender prime rib. All beef is aged and hand-trimmed daily by the chefs. On the menu are three sizes of a lean, firm sirloin, a velvety soft filet, a classic cut T-bone, and both a traditional and blackened prime rib. The manager’s specials include a filet topped with crab and Béarnaise sauce and a filet Monte Vista that’s charbroiled and covered in green chili and Mornay sauce. Don’t miss the surf-and-turf combos that pair a sirloin steak with either lobster, king crab or prawns. Fresh, daily-baked bread accompanies every meal. Your taste buds will be salivating from the mouthwatering aromas emanating from the kitchen the minute you sit down at this casual steakhouse. Chefs are grilling 10, 12 and 14-ounce hand-cut incredibly tender and succulent rib eyes and flavorful New York strips, covered in a secret yet tantalizing house seasoning. Try either New Mexico-style which is, of course, topped with green chile and cheddar cheese. The tenderloin steak tips also pay tribute to the Southwest and are covered with green chile, cheddar cheese and mushrooms. Save room the green chile grits … you’ll be glad you did. Right outside of town, in a small hotel is a dining room reminiscent of an early 1900s speakeasy … a little dark, a little small and very cozy. With only a dozen or so tables, the atmosphere is relaxed and informal. The steaks, however, are anything but, thanks to the chefs’ commitment to top-quality, hand-cut USDA choice steaks grilled to perfection. There’s a New York strip served with chile verde, tomatillo salsa and fried pickled onion strips and a bourbon ribeye that are melt-in-your-mouth good. The king and queen of the menu are a mouthwatering T-bone and a fork-tender cut of prime rib, respectively. As a building on the National Register of Historical Places, there’s a story in every room that captures the narratives of famous and infamous people, as well as tales of ghostly sightings. But the real story here is the fact that this is the only steakhouse in the State that has a dedicated beef-aging room. What does that mean? It means beef is finished to perfection before cooking even begins. The result is tender, juicy and flavorful steaks—sirloin, ribeye, New York, Chateaubriand for two—all a meal for the history books. Step inside and you’ll feel like you’re on the ranch. Decor and atmosphere capture the feel of the West, and the food is traditional ranch fare cooked impeccably. All food is prepared on a gridiron over a mix of aromatic wood like mesquite and hickory, and adds a one-of-a-kind flavor. Typical fare includes luscious filet mignons, New York strips, bone-in rib eyes, slow roasted prime rib, plus a few non-traditional items like bacon wrapped bison tenderloin, and an antelope chop and rack of lamb. Get a taste of the Southwest with the chorizo stuffed dates appetizer. Right on the southern edge of the Cibola National Forest is this small town that if you blink you’re past it. Don’t blink! Get off the highway and make a pit-stop at this motel, general store, gas station, RV park and cafe … really stop for the cafe and get a steak, and specifically a bacon wrapped ribeye. You get to select your steak from the meat case, aged and corn-fed beef, and then it’s hand-cut and cooked to order. An out-of-the-way stop, but worth the effort. Don’t miss the homemade pies!